A Des Moines Register investigation found law enforcement in Iowa has used civil forfeiture laws to seize $43 million in the past six years — sometimes without ever arresting the person involved or charging them with a crime. Representative Mary Wolfe, a Democrat from Clinton, said the newspaper’s report has sparked posts on her Facebook page. Wolfe, a member of the House Government Oversight Committee, cited the newspaper’s accounts during the committee’s meeting on Thursday. Republican Representative Bobby Kaufmann of Wilton is chairman of the Oversight Committee and he agreed the panel should address the issues that have been raised. “I’ve had a lot of law enforcement contact me and say, ‘Hey, let’s see if we can find a way to narrow this down so that we’re not endangering the 98 percent of law enforcement that do this properly,” Kaufmann said. 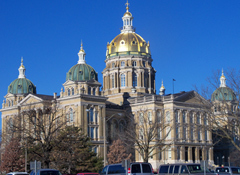 The issue is being raised on the presidential campaign trail in Iowa, too. Kentucky Senator Rand Paul, who will formally enter the GOP race next week, is sponsoring legislation to reign in forfeitures and is bringing up the issue during campaign speeches here.